Ford GT with Lysholm® supercharger. Lysholm® Technologies deliver superchargers as an OEM supplier for both automotive and marine engine applications. OEM manufacturers use the Lysholm® Twin Screw Superchargers to improve power, torque and handling, without sacrificing low fuel consumption and low emission levels. The Lysholm® Twin Screw Superchargers are the most reliable, performance-enhancing items for a wide range of boost levels. The combination of cost efficient performance and emission improvement of the engines, makes our products an exciting alternative for the OEM market. Lysholm® Technologies participates in many different projects on the OEM market in the US. 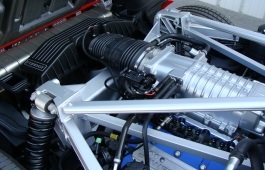 Ford’s GT sports car is equipped with Lysholm®’s screw supercharger. Ford decided to manufacture a evolution version of the classic car, famous for competing at Le Mans in the 1960s, when the company celebrated its 100th anniversary in June, 2003. "In the 24 Hours of Le Mans, June 10-11, Dan Gurney and A.J. Foyt won in a Shelby American Mark IV, ahead of two Ferraris. This was the first Le Mans win for an all-American entry - the car was developed and built in the USA, powered by an American engine, fielded by a U.S. team and driven by Americans. It was the second and last race for the Mark IV. This race is noted for beginning the tradition of spraying champagne to celebrate winning. Back on its traditional June weekend, the Le Mans 24 Hours was won by Ford for the fourth consecutive year. GT40 chassis 1075 did it again, driven by Jacky Ickx and Jackie Oliver. This was only the second time ever that the race had been won two years in a row by the same car. Victory margin over the second-place Porsche 908 was 120 meters, the closest finish ever in the 24 Hours of Le Mans. It was the final race for the legendary chassis, which had become the most famous and successful car in the Ford GT line." Text, Courtesy of Ford Motor Company. The Ford GT has received a lot of press attention. Some people have even called it the American Ferrari. The GT had a production run of 4,500 cars over a two and a half year period. Media attention and interest among American car enthusiasts has also meant good PR for Lysholm® and its compressor technology.